blew it right off the device. layer of Natrium that wasn't there before. stuff. It's just showing up. Magnetic fields and brightness of the planets are changing. photographs that have been taken more recently..
is getting higher. Their atmospheric qualities are changing. Uranus and Neptune appear to have had recent pole shifts. were sizably offset from where the rotational pole was. stronger than it was before. into an area of energy that is different - that is higher. tail is always pointing away from the Sun. that we used to see at the front end of the Solar System. end of the Solar System. of it to form, so you see more luminosity, more brightness. works, how it functions, and what kind of life it supports. up to a crescendo where there is going to be a sudden shift. them up actually expand in terms of their physical size. Open your eyes and you will see, open your heart and your will feel. Changes in Our Solar System: Is Trouble Coming? Vargas: Many scientists in the field of artificial intelligence believe that it is only a matter of time before computers will be autonomous, thinking beings that will surpass humans. Do you think this is possible? Hawking: I think there's no qualitative difference between the brain of an earthworm and a computer. I also believe that evolution implies there can be no qualitative difference between the brain of an earthworm and that of a human. It therefore follows that computers can, in principle, emulate human intelligence, or even surpass it. In this Report we shall be citing specific scientific papers backing up these “system-wide,” apparently systemic changes -- evidence derived from published, mainstream sources, compiled by researchers at major institutions, who obviously (from the authors’ own comments) haven’t themselves fully grasped the magnitude (to say nothing of the underlying cause) of what they’re seeing… or, why they’re seeing it right now. This new, modified aether is, in fact, a “massless, non-electromagnetic aether” – a charge-free transfer medium pervading all of space, and conveying “hyperdimensional energy” from more complex, higher dimensions into “our” dimension. While the Correas’ work is entirely separate from our own, both authors strongly believe that there is a fundamental connection between a “massfree aether,” and the equally demonstrable hyperdimensional energies it is conveying into our three spatial dimensions. Further experimental work… will advance efforts to ultimately prove or disprove such a critical connection. The amount of sulfur in Venus’ atmosphere was found to have decreased “dramatically” between 1978 and 1983. Unfortunately, no study we have yet located assigned a percentage figure to this planet-wide change. But in order to earn the word “dramatic,” it could well have been a 1000-percent decrease (or more!) of sulfur compounds, in only five years. This huge atmospheric “global change” is currently blamed on a hypothetical “giant volcanic eruption,” which released these sulfur compounds all at once into the Venusian atmosphere, sometime just before 1978 (when a fleet of US spacecraft synchronistically arrived to measure the immediate aftereffects). This anomalous sulfur then mysteriously settled out of the Venusian atmosphere at a very rapid rate. I remember about three years ago Venus was really really brighter than usual and yet there was nothing about it anywhere that i could find that even mentioned it.It was very bright for a few months and i looked everywhere for info on it but couldn't find a thing about it. Last edited by ponda; 23rd January 2011 at 02:43. Translation assistance by Fran Forstadt. Fran is a freelance artist and translator, with a B.A. in English. Need some work done contact Fran. But of all the things the Jesuit member of the S.I.V. told Barbato in 2001, two are really disquieting from my point of view. We can begin to look into the first one: At the very least, beginning in 2004 Planet X (the Sumerian Nibiru) would have begun to affect the Solar System with its presence (see my interview with Cristoforo Barbato on pg. 40, UFO Notiziario, Italian bimonthly magazine, number 62, April-May 2006). Is there any evidence of it? The answer could be yes because the evidence seems to come from several sources, not just one. Let us see what they could be. First of all, anomalous Sun activity. If you have patience you can review the data recorded by the Nobeyama Radioheliograph (NoRH), a Japanese radio telescope which works as a radio interferometer dedicated to observing the Sun. As Khoji Lang pointed out, "The Sun definitely is strongly connected with what's going on down here on Earth." (Shooting Star, March 21, 2003 - monthly cosmological newsletter by Khoji Lang (http://www.detailshere.com/solaractivity.htm). There is also a chart on the Nobeyama website where you can see the incredible trend of the solar flares in the last years. Here is the link: http://solar.nro.nao.ac.jp/norh/html/n_flares.html. 1) the Global Warming on Pluto Puzzles Scientists (see Special Reports, "SUV's On Jupiter? - Solar System Warming, Are humans Responsible for Climate Change on the Outer Reaches of the Solar System, or is it the Sun?" (2006 11 17- Space.com): [...] "In what is largely a reversal of an August announcement, astronomers today said Pluto is undergoing global warming in its thin atmosphere even as it moves farther from the Sun on its long, odd-shaped orbit." 2) the Global Warming Detected on Triton, one of Neptune's satellites, June 28, 1998: [...] "At least since 1989, Triton has been undergoing a period of global warming," confirms astronomer James Elliot, professor of Earth, Atmospheric and Planetary Sciences at Massachusetts Institute of Technology. "Percentage-wise, it's a very large increase." 3) the Global Warming on Mars reported in the NASA JPL article, "MOC Observes Changes in the South Polar Cap: Evidence for Recent Climate Change on Mars," MGS MOC Release No. MOC2-297, December 6, 2001: [...] "New MGS Mars Orbiter Camera (MOC) images have provided a startling observation: The residual Martian south polar cap is changing. The fact that it is changing suggests that Mars may have major global climate changes that are occurring on the same time scales as Earth's most recent climate shifts, including the last Ice Age. MOC images of the south polar cap taken in 1999 were compared with images of the same locations taken in 2001, and it was discovered that pits had enlarged, mesas had shrunk, and small buttes had vanished." Kofi Annan today slammed global warming skeptics as being "out of step" and "out of time," but how will altering human activity halt climate change when the evidence clearly indicates that the sun itself and not SUV's is heating up the entire solar system? "The U.N. chief lamented "a frightening lack of leadership" in fashioning next steps to reduce global emissions. "Let us start being more politically courageous," he urged the hundreds of delegates from some 180 member nations of the 1992 U.N. climate treaty," reports Forbes. But how do we square the fact that almost every planet in our solar system is simultaneously undergoing temperature change and volatile weather patterns. Does this not suggest that global warming is a natural cycle as a result of the evolving nature of the sun? Can Al Gore fill me in on this one? In what is largely a reversal of an August announcement, astronomers today said Pluto is undergoing global warming in its thin atmosphere even as it moves farther from the Sun on its long, odd-shaped orbit. - Current Science & Technology Center: Global Warming on Mars? A study of the ice caps on Mars may show that the red planet is experiencing a warming trend. If both Mars and Earth are experiencing global warming, then perhaps there is a larger phenomenon going on in the Solar System that is causing their global climates to change. NASA says its Cassini spacecraft has found a hurricane-like storm at Saturn's South Pole, nearly 5,000 miles across -- or two-thirds Earth's diameter. There may not be much industrial pollution on Neptune's largest moon, but things are hotting up nonetheless. "At least since 1989, Triton has been undergoing a period of global warming," confirms astronomer James Elliot, professor of Earth, Atmospheric and Planetary Sciences at Massachusetts Institute of Technology. "Percentage-wise, it's a very large increase." Solar radiation reaching the Earth is 0.036 percent warmer than it was in 1986, when the current solar cycle was beginning, a researcher reports in a study to be published Friday in the journal Science. The finding is based on an analysis of satellites that measure the temperature of sunlight. The simple fact is that throughout the ages the earth has swung wildly between a warm, wet, stable climate, to a cold, dry and windy one - long before the first fossil fuel was burned. The changes we are now witnessing are a walk in the park compared to the battering that our planet has taken in the past. This is not a defense of the oil cartels or the Neo-Con wreckers, who would have every motivation to ignore global warming whether it is man-made or not. Nor is it a blanket denial of the fact that the earth is getting very gradually hotter, but how do we reconcile global warming taking place at the farthest reaches of the solar system with the contention that it is caused by human activity? 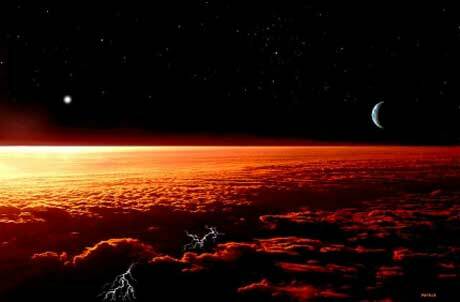 Have our exhaust fumes left earth's atmosphere and slipped through a black hole to Triton? The assertion that global warming is man made is so oppressively enforced upon popular opinion, especially in Europe, that expressing a scintilla of doubt is akin to holocaust denial in some cases. Such is the insipid brainwashing that has taken place via television, newspapers and exalted talking heads - global warming skeptics are forced to wear the metaphoric yellow star and only discuss their doubts in hushed tones and conciliatory frameworks, or be cat-called, harangued and jeered by an army of do-gooders who righteously believe they are rescuing mother earth by recycling a wine bottle or putting their paper in a separate trash can. Fearmongering about an imminent climate doomsday also hogs news coverage and important environmental issues like GM food, mad scientist chimera cloning and the usurpation and abuse of corporations like Monsanto flies under the radar. Global warming is cited as an excuse to meter out further control and surveillance over our daily lives, RFID chips on our trash cans, GPS satellite tacking and taxation by the mile, as well as a global tax at the gas pump. The extremist wing of the environmentalist movement, characterized by people like Dr. Erik Pianka, advocate the mass culling of humanity via plagues and state sanctioned bio-terrorism, in order to "save" the earth from the disease of humanity. Nazi-like genocial population control measures and the environmental establishment have always held a close alliance. The orthodox organized religion of global warming and its disastrous consequences for our freedom of speech, freedom of mobility and our right to remain outside of the system, needs to be questioned on the foundational basis that the phenomenon is solar-system wide and it is mainly caused by the natural evolution of the sun and not human activity. There are at least four unexplained anomalies connected with astrometric data. Perhaps the most disturbing is the fact that when a spacecraft on a flyby trajectory approaches the Earth within 2000 km or less, it often experiences a change in total orbital energy per unit mass. Next, a secular change in the astronomical unit AU is definitely a concern. It is reportedly increasing by about 15 cm yr−1. The other two anomalies are perhaps less disturbing because of known sources of nongravitational acceleration. The first is an apparent slowing of the two Pioneer spacecraft as they exit the solar system in opposite directions. Some astronomers and physicists, including us, are convinced this effect is of concern, but many others are convinced it is produced by a nearly identical thermal emission from both spacecraft, in a direction away from the Sun, thereby producing acceleration toward the Sun. The fourth anomaly is a measured increase in the eccentricity of the Moon's orbit. Here again, an increase is expected from tidal friction in both the Earth and Moon. However, there is a reported unexplained increase that is significant at the three-sigma level. It is prudent to suspect that all four anomalies have mundane explanations, or that one or more anomalies are a result of systematic error. Yet they might eventually be explained by new physics. For example, a slightly modified theory of gravitation is not ruled out, perhaps analogous to Einstein's 1916 explanation for the excess precession of Mercury's perihelion. In five of the six flybys, the scientists have confirmed anomalies. "I am feeling both humble and perplexed by this," said Anderson, who is now working as a retiree. "There is something very strange going on with spacecraft motions. We have no convincing explanation for either the Pioneer anomaly or the flyby anomaly." In the one probe the researchers did not confirm a noticeable anomaly with, MESSENGER, the spacecraft approached the Earth at about latitude 31 degrees north and receded from the Earth at about latitude 32 degrees south. "This near-perfect symmetry about the equator seemed to result in a very small velocity change, in contrast to the five other flybys," Anderson explained — so small no anomaly could be confirmed. The five other flybys involved flights whose incoming and outgoing trajectories were asymmetrical with each other in terms of their orientation with Earth's equator. For instance, the NEAR mission approached Earth at about latitude 20 south and receded from the planet at about latitude 72 south. The spacecraft then seemed to fly 13 millimeters per second faster than expected. While this is just one-millionth of that probe's total velocity, the precision of the velocity measurements was 0.1 millimeters per second, carried out as they were using radio waves bounced off the craft. This suggests the anomaly seen is real — and one needing an explanation. The fact this effect seems most evident with flybys most asymmetrical with respect to Earth's equator "suggests that the anomaly is related to Earth's rotation," Anderson said. As to whether these new anomalies are linked with the Pioneer anomaly, "I would be very surprised if we have discovered two independent spacecraft anomalies," Anderson told SPACE.com. "I suspect they are connected, but I really do not know." These anomalies might be effects we see with an object possessing a spacecraft's mass, between 660 and 2,200 lbs. (300 and 1,000 kg), Anderson speculated. "Another thing in common between the Pioneer and these flybys is what you would call an unbound orbit around a central body," Anderson said. "For instance, the Pioneers are flying out of the solar system — they're not bound to their central body, the sun. For the other flybys, the Earth is the central body. These kinds of orbits just don't occur very often in nature — it could be when you get into an unbound orbit around a central body, something goes on that's not in our standard models." We will list the recent large-scale events in the Solar System in order to fully understand, and comprehend, the PlanetoPhysical transformations taking place. This development of events, as it has become clear in the last few years, is being caused by material and energetic non-uniformity's in anisotropic interstellar space[2,3,4]. In its travel through interstellar space, the Heliosphere travels in the direction of the Solar Apex in the Hercules Constellation. On its way it has met (1960's) non-homogeneities of matter and energy containing ions of Hydrogen, Helium, and Hydroxyl in addition to other elements and combinations. This kind of interstellar space dispersed plasma is presented by magnetized strip structures and striations. The Heliosphere [solar system] transition through this structure has led to an increase of the shock wave in front of the Solar System from 3 to 4 AU, to 40 AU, or more. This shock wave thickening has caused the formation of a collusive plasma in a parietal layer, which has led to a plasma overdraft around the Solar System, and then to its breakthrough into interplanetary domains [5,6]. This breakthrough constitutes a kind of matter and energy donation made by interplanetary space to our Solar System. A series of large PlanetoPhysical transformations. A change in the quality of interplanetary space in the direction of an increase in its interplanetary, and solar-planetary transmitting properties. The appearance of new states, and activity regimes, of the Sun. 1.1 A Series of Large PlanetoPhysical Transformations. The following processes are taking place on the distant planets of our Solar System. But they are, essentially speaking, operationally driving the whole System. 1.1.1 A growth of dark spots on Pluto . 1.1.2 Reporting of auroras on Saturn . 1.1.3 Reporting of Uranus and Neptune polar shifts (They are magnetically conjugate planets), and the abrupt large-scale growth of Uranus' magnetosphere intensity. 1.1.4 A change in light intensity and light spot dynamics on Neptune [9,10]. 1.1.5 The doubling of the magnetic field intensity on Jupiter (based upon 1992 data), and a series of new states and processes observed on this planet as an aftermath of a series of explosions in July 1994 [caused by "Comet" SL-9] . That is, a relaxation of a plasmoid train [13,14] which excited the Jovian magnetosphere, thus inducing excessive plasma generation  and it's release in the same manner as Solar coronal holes  inducing an appearance of radiation belt brightening in decimeter band (13.2 and 36 cm), and the appearance of large auroral anomalies and a change of the Jupiter - Io system of currents [12, 14]. Could it be revenge for being demoted to "dwarf planet" status in 2006? New Hubble Space Telescope photos show that Pluto has turned redder--as if it were angry--and its ice sheets are also shifting around, according to the Associated Press. In recent photos, Pluto is turning up significantly redder than it has during the past several decades. It still looks vaguely yellow-orange, but astronomers claim there is about 20 percent more red pigment in there than there was before, the report said. This is despite the fact that a "season" lasts 120 years in some regions of the planet. "It's a little bit of a surprise to see these changes happening so big and so fast," said astronomer Marc Buie of the Southwest Research Institute in Boulder, Colo., in the article. "This is unprecedented." The current hypothesis is that solar winds strip hydrogen atoms out of the planet's methane, leaving carbon-rich areas that tend to look darker and redder, the report said, though why it's happening so quickly isn't yet clear. Since Pluto takes 248 years to revolve around the Sun, it's difficult to figure out what's going on; the last time Pluto was at its farthest point from the Sun was 1870, about 60 years before we even knew it existed, the report said. The Huffington Post – January 22, 2011. […] But doomsday sayers should be careful about speculation on this one. If the star does go super-nova, Earth will be showered with harmless particles [neutrinos], according to Carter. “They will flood through the Earth and bizarrely enough, even though the supernova we see visually will light up the night sky, 99 per cent of the energy in the supernova is released in these particles that will come through our bodies and through the Earth with absolutely no harm whatsoever,” he told news.com.au. Carter suggests Betelgeuse could go supernova at any moment (true), and when it does, 99% of its energy will be released as neutrinos that will irradiate our solar system (true). But he says there’s nothing to worry about since they are harmless (false). […] It’s a mystery that presented itself unexpectedly: The radioactive decay of some elements sitting quietly in laboratories on Earth seemed to be influenced by activities inside the sun, 93 million miles away. […]The story begins, in a sense, in classrooms around the world, where students are taught that the rate of decay of a specific radioactive material is a constant. This concept is relied upon, for example, when anthropologists use carbon-14 to date ancient artifacts and when doctors determine the proper dose of radioactivity to treat a cancer patient. […] On Dec 13, 2006, the sun itself provided a crucial clue, when a solar flare sent a stream of particles and radiation toward Earth. Purdue nuclear engineer Jere Jenkins, while measuring the decay rate of manganese-54, a short-lived isotope used in medical diagnostics, noticed that the rate dropped slightly during the flare, a decrease that started about a day and a half before the flare. […] Their findings strengthened the argument that the strange swings in decay rates were caused by neutrinos from the sun. The swings seemed to be in synch with the Earth’s elliptical orbit, with the decay rates oscillating as the Earth came closer to the sun (where it would be exposed to more neutrinos) and then moving away. Going back to take another look at the decay data from the Brookhaven lab, the researchers found a recurring pattern of 33 days. It was a bit of a surprise, given that most solar observations show a pattern of about 28 days – the rotation rate of the surface of the sun. The explanation? The core of the sun – where nuclear reactions produce neutrinos – apparently spins more slowly than the surface we see. “It may seem counter-intuitive, but it looks as if the core rotates more slowly than the rest of the sun,” Sturrock said. All of the evidence points toward a conclusion that the sun is “communicating” with radioactive isotopes on Earth, said Fischbach. There we see a possible link between neutrinos and radioactive decay on earth. Radioactive decay is a purely quantum mechanical thing, it’s not caused by any physical factor. Therefore neutrinos affect quantum processes, such as decay rates. Note that biological and neural activity are also based on quantum processes. The geothermal gradient is the rate at which the Earth’s temperature increases with depth, indicating heat flowing from the Earth’s warm interior to its cooler surface. Away from tectonic plate boundaries, it is 25-30°C per km of depth in most of the world. Strictly speaking, geo-thermal necessarily refers to the Earth but the concept may be applied to other planets. The Earth’s internal heat comes from a combination of residual heat from planetary accretion (about 20%) and heat produced through radioactive decay (80%). So 80% of earth’s core and mantle heat comes from radioactive decay. Radioactive decay rates are affected by neutrinos. Supernovas release 99% of their energy as neutrinos. Taken to its logical conclusion, this implies that if Betelgeuse goes supernova and becomes bright enough to appear like a second sun, Earth will be irradiated by those neutrinos, decay rates will be altered, and there could be enough of a change in core-mantle temperatures to upset the convective processes and disturb the tectonic plates, hence global earthquakes and volcanoes. It need not be Betelgeuse nor 2012 specifically, but something else like detailed in LaViolette’s Galactic Superwave Theory. 1) Dating via Carbon-14 and other isotopes may be thrown way off by solar or interstellar neutrino radiation, since it assumes a constant decay rate, which in actuality may be arrested or suddenly accelerated by sporadic high intensity neutrino showers. 2) Wilhelm Reich discovered that orgone energy (crude form of etheric energy) affects radioactive decay rates, even neutralizing certain radioactive materials. If neutrinos also have this effect, perhaps orgone and neutrinos are closely related. If so, maybe supernovas and solar flares release bursts of etheric energy. 3) As is known in occult and contactee writings, changes in etheric energy affect human perception and consciousness. For instance, if Earth were to enter a dense region of etheric energy, people would automatically shift into a state of consciousness similar to that of clairvoyant trance or the kind of psychic activation experienced in the presence of powerful shamans or alien entities. In the terminology of Carlos Castaneda, this would involve a radical shift in the assemblage point. If this were to happen concurrently with global seismic upheavals, that would make for an extremely entertaining ending to the World as We Know It. I reference the above news articles not to predict doom, but to explore a single physico-etheric mechanism that could account for a broad range of end-time prophecies. Great work Irish, thanks for all your research. Jupiter is famous for its Great Red Spot. This spot has persisted for at least 300 years, since it was first viewed through one of the first telescopes. This region of high pressure, frequently referred to as a storm, consists of clouds whose tops are higher and colder than the surrounding region. Jupiter's Great Red Spot has had company in recent years. The appearance of Red Spot Jr. in 2005 and another smaller red spot in 2008, all in the same area, has led some to speculate that Jupiter is undergoing climate change. The words "climate change" are big buzz words in the media at present, generally referring to man's alteration of Earth's atmospheric composition. Climate change has natural sources as well. Climate change has been occurring on the planets since long before man arrived. The climate change on Jupiter is unrelated to what is currently occurring on Earth. Complicated atmospheric systems have cycles. Jupiter appears to be entering a new cycle. One of the paradoxes about Jupiter's atmosphere is that the upper level clouds have the same temperature at the poles as they do at the equator. In order for the temperature to be so homogeneous across the cloud tops of giant Jupiter, a lot of mixing must be going on. Dr. Philip S. Marcus, Ph.D., Professor of Fluid Mechanics for the University of California at Berkeley, says, "When things move chaotically, they are really, really good at mixing." He compares the cloudy atmosphere to bumper cars, which constantly jostle each other and transfer energy. Habibullo Abdussamatov, head of space research at St. Petersburg's Pulkovo Astronomical Observatory in Russia, says the Mars data is evidence that the current global warming on Earth is being caused by changes in the sun. Also, the moon is growing an atmosphere that's made up of a compound Dmitriev refers to as "Natrium." Dmitriev says that, around the moon, there is this 6,000-kilometer-deep layer of Natrium that wasn't there before. Natrium, as any high-school chemistry student knows, is the old name for sodium, from which the symbol Na is derived, as in NaCl = sodium chloride (common salt). Natrium is not a compound, it is an element. That should be enough to set off your BS detector, quite apart from the author's complete lack of supporting references.